With Apple's September Event only a few days away, AppleInsider discusses everything including iPhones, iOS 12, AirPower, and budget MacBooks are either expected or rumored to debut. Let's go through everything anticipated to be in the pipeline and whether we're likely see them released at the event next week, within a couple months or sometime in 2019. First of all, there's a reason why many call Apple's gathering the iPhone event. New iPhones have been released at the September media event for the past six years. There's also been quite a few leaks from Apple parts suppliers, and even Apple itself. Just a few days ago, Apple inadvertently leaked images of what is believed to be the next-generation iPhone, now sporting a new gold frame. 9to5Mac shared those images, saying the device will likely be called the iPhone XS. There have been a number of leaks pointing to a cheaper 6.1-inch LCD model as well, a device rumored to pack a TrueDepth notch for Face ID authentication, just like the higher-end OLED models. The Apple Watch Series 4 has been rumored for quite a while, and an image of the supposed device was discovered alongside the iPhone XS leak, hinting that both products could be released at the same time. Since the Series 1, 2 and 3 were released at Apple's September Events, it's almost guaranteed that the new Series 4 will be announced on the 12th. This one may be completely obvious, but we're almost 100% guaranteed to see the release of macOS Mojave, iOS 12, tvOS 12 and watchOS 5 at Apple's upcoming event on the 12th. The software will be available as free updates, but only if your hardware supports it. For example, the original Series 0 Apple Watch won't support WatchOS 5. Since this is an iPhone-focused event, the chances of other rumored Apple devices making an appearance are less firm. Let's start with the iPad Pro. Back in June, Apple filed new part numbers for 2018 MacBooks and iPads, which basically guarantee the company is readying those new devices for release. When the new 2018 MacBook Pros were released, the new iPad Pro models mentioned in the government filings were left out, as were two MacBook products that could easily be related to new low-cost MacBooks. Further proof that Apple is developing new iPad hardware with the TrueDepth camera system came in July when a developer found evidence of the Animoji framework being adapted to support an iPad-sized screen. There were also some interesting changes in the iOS 12 beta that brought a lot of iPhone X-inspired gestures to iPad, hinting at a redesign that integrates Face ID. There have been a lot of rumors and supply chain leaks hinting at a release in the fall timeline, and there is a chance that a new iPad will be part of next week's festivities, but Apple has in the past elected to debut refresh tablets at a separate event. That could be the case this year, as a major redesign is expected in order to accommodate the removal of Touch ID and the introduction of TrueDepth. At least year's September Event, Apple announced AirPower, a wireless charger than can charge multiple devices at the same time, regardless of how you place them. Seeing as it's already been a year since that announcement, and the product was delayed, a September launch alongside iPhone and Apple Watch is likely. A report from DigiTimes claimed we'll likely see Apple announce a release date for the charger on the 12th. They also mentioned the price will range from around $161-193, but if my personal opinion means anything, I think it'll be priced at around $149. Apple also announced an optional new AirPods wireless charging case, which has yet to be released. That is almost guaranteed to debut alongside the AirPower mat, since it was used to market the wireless charger last year. Now onto some other hardware, like a low-cost MacBook refresh. There's been a bunch of rumors and leaks pointing to the release of a new MacBook or MacBook Air sometime this year. Apple recently updated its MacBook Pro line, but for some reason, they chose to leave the cheaper MacBooks alone. That question was potentially answered last month when Intel revealed six new notebook-oriented processors that would be perfect candidates to power Apple's upcoming MacBook refresh, and Intel themselves claimed notebooks packing those chips would be available starting this fall. It now makes perfect sense why Apple would wait to update the cheaper MacBooks, but will they get released at Apple's September event? There's a chance, but probably not, since the event is mostly focused on iPhones. Some of those new processors would be perfect for the Mac mini, which is also rumored to be refreshed sometime this fall. It hasn't seen an update since 2014, and it's beginning to become outdated compared to the rest of the market. This year would be perfect for a refresh, and it'll likely be released at the same time as the low-cost MacBook. As to whether we'll see a release at Apple's Event, most likely not, for the same reasons. Last year, Apple released new iMacs alongside new MacBook Pros, which, to our surprise, didn't happen this year. It could be the case that Apple would skip out on iMac updates like they did in 2016, but there have been some analysts, like Ming-Chi Kuo, who believe Apple will release new iMacs this year. Kuo predicts the new model to have a significant display-performance upgrade, which could mean the addition of Apple's variable framerate ProMotion technology, which debuted on the 2017 iPad Pro. Since the event on the 12th is iPhone-oriented, we likely won't see iMacs being released. There's a much higher chance that the new iMacs, low-cost MacBooks and Mac Mini will be released at the same time, and that seems like far too much to add to the September event. We're most likely looking at some time later in the Fall, possibly October, but there's no way to know for sure. AirPods 2.0 and Apple-branded over-ear headphones have also been rumored to be in the pipeline. The AirPods will feature upgrades like "Hey Siri" support and better water resistance, while the headphones are expected to feature premium audio technology as part of Apple's new push into that market. Earlier rumors pointed to a possible release this year, but more recent rumors are pushing those dates into 2019, so don't wait on those devices. There's also been rumors of a cheaper HomePod in the works, and the story's the same for its release schedule. Early rumors pointed to a 2018 release due to slow current HomePod sales, but recent rumors again hint at a 2019 release, so definitely don't expect that at Apple's upcoming event. Finally, let's talk about the 2019 Mac Pro. 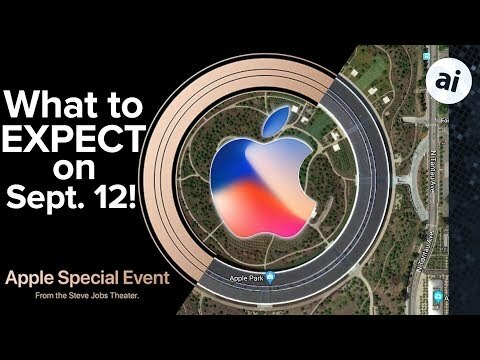 Obviously, we're not expecting a release until 2019, but there is a chance that Apple will give us a sneak peak during the event on Sept. 12th. To wrap it up, definitely expect to see releases of the new iPhones, a new Apple Watch, software updates and potentially the new AirPower mat and AirPods case. There's a chance we'll see new iPad Pros, but they may end up being released sometime later this fall, perhaps alongside a low-cost MacBook, iMac and Mac mini. AppleInsider will be covering the September 12 event, along with rumors and news before and after Apple's anticipated launches. Perspective plays aside is that on the charts? Wonder when we will get a phone with a screen on both sides ? So we _may_ finally get a date that the AirPower will be available...a year after it was announced? I'll be surprised. 12th Sept is the day some older but working fine machines sentenced to die because they will not receive any further OS updates for security and thus not safe to use any more. Isn’t it “planned obsolescence”? Given that Sierra and El Cap are still getting security updates to date, I'm going to say that you're still full of it. I will buy an iPad Mini 5/Pro! Otherwise, I will wait a year before moving to a Samsung 8”! I find AirPods wirh Siri to be at least mildly interesting. If that was the only new feature I would hesitate to upgrade. I’ve noticed that when I’m using my AirPods Siri’s voice doesn’t sound very good, even though music does, almost staticky. I notice the very same thing when I use Siri in my car while connected to Bluetooth. However, in my wife’s car with CarPlay Siri sounds very clear. What exactly is being “sentenced to die”? All iOS 11 devices will work with iOS 12. Mojave is limiting the Macs that will run it, but it’s not like Apple will discontinue support for High Sierra or even Sierra on release day. The original Apple Watch won’t recieve watchOS 5, but come on, it’s not like watchOS 4 is ancient software or anything. A tad overdramatic I’d say. Seriously, any device that isn’t capable of being uodated will still work just the way it has after all the new OSes are released. However, I wouldn’t expect a response or anything reasonable from this poster. “ivanh” is what I like to think of as a drive-by commenter, meaning, speeds past a thread, fires a few Apple-disparaging shots and just keeps on going so as not to catch any return fire. The MO is the same over and over. Ha ha! So good! The “thousands of stories” about Bad Apple. Apple traditionally limits itself to iOS news at the iPhone events, though I expect they will mention the Mojave release. I’m hopeful for a second, Mac-focused event in October. I really hope the redesigned iPads are released at the iPhone event on the 12th. It’s my most anticipated new product introduction as I’m finally taking the plunge and getting one. I’m curious to know why a product like AirPower which overall is far less complex than an iPhone or iPad has taken so long to come to market after its initial announcement? I noticed the SE was not mentioned. Over the past weekend, I happened by my carrier's website (Virgin Mobile) and noticed they were clearing out new 32GB SEs for $160. So I got one for back up. 3 days later they were 'out of stock'. Sounds to me like there's a new SE in the works. Apple is becoming a joke. Two products announced a year ago are still vaporware. Quality issues with Macs, no real innovation for that product in years. All their attention is on iPhone. They’ll coast on Job’s legacy for a while but they need to get their asses in gear. Tim Cook is uninspiring.